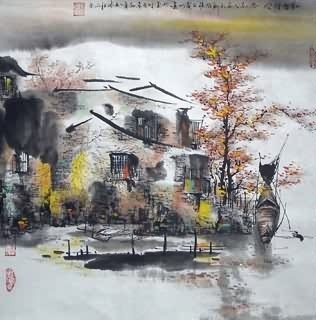 Chinese water township painting is special. Water township mainly refers to the township which is surrounded and divided by lakes and rivers. 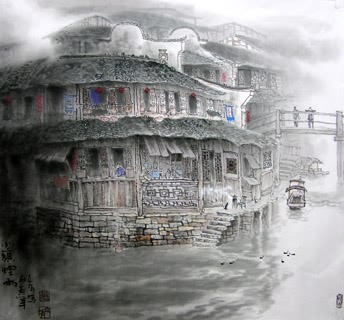 It can be divided into main two types: Jiangnan (regions south of the Yangtze River) water townships and Lingnan (south of the Five Ridges) water townships. 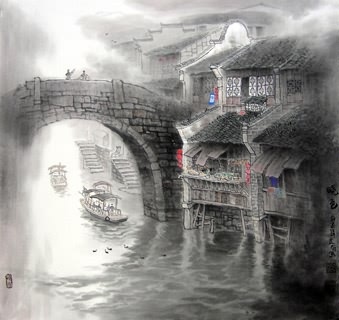 Such as Suzhou and Hangzhou has the most typical Jiangnan water township, and Lingnan water township mostly is locate in the regions is of an abundance of water area. 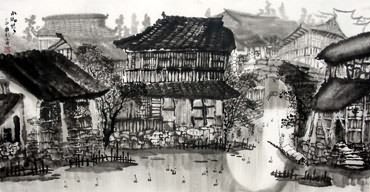 Chinese Jinagnan Water Township Painting : (江南水乡) The size and layout of folk houses of Jinagnan water township are quite distinctive. 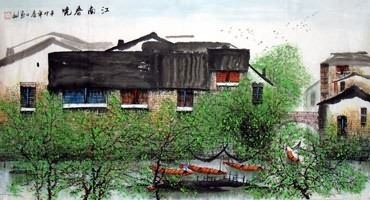 The sculptured ornament of Jiangnan folk houses has many varieties, but seldom using colorized pattern. The wall is whitewashed and the roof of the house is of grey tiles. Timbers for building houses are brownish black or brownish red, ect. 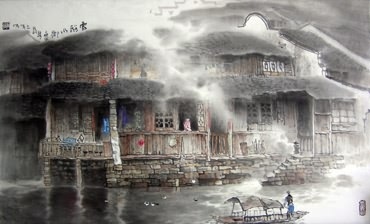 Therefore, these ancient residential houses are quietly elegant. Owing to costly land resources, so people try to make the best use of the inside and outside space of house. Almost every family built a small pier outdoors because they live close by the river or lake. Housewife come to pier to wash rice, vegetables and colthes every day, and small boat come and go also can berth in here. 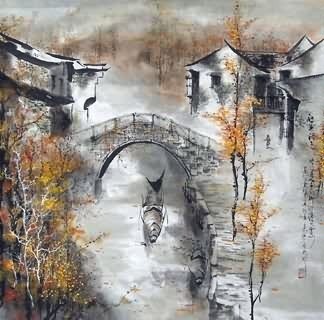 Compare with the waterway, the alley seems very narrow, some of it only can allow one person and one water buffalo to walk together. Winding alleys, tall courtyard walls, it really makes people feel that the path will lead them to a secluded quiet place. 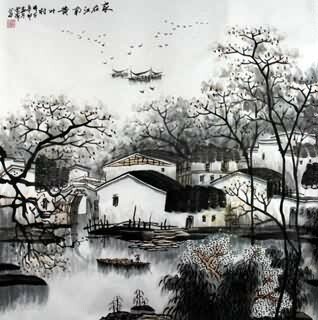 Chinese Lingnan Water Township Painting : (岭南水乡) Lingnan water township, although also has stone bridge, lakes and rivers and waterside household, its folk culture is widely different from Jiangnan water township. 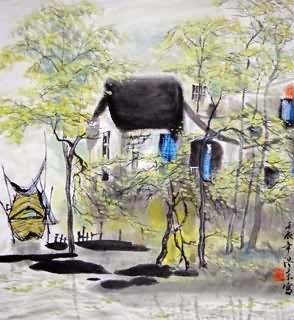 Perhaps it is influenced by Lingnan native culture. 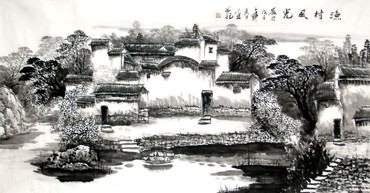 If we compare Jinagnan water townships to beautiful woman, in that way, Lingnan water townships are man. People here plant numerous banana trees, litchi trees, and longan trees. When those fruits are mature, people will ship fruits outside for selling. There are many water gate vary in size to regulate the water level and the waterway traffic, making sure boats come and go are secure. Houses made of barks of Douglas fir are biult next to river and hung in the air. They look like a ancient fairytale, making people feel warm. InkDance Price: USD 486 /GBP 399 /EUR 462 Sold, you can customize it. InkDance Price: USD 2410 /GBP 1977 /EUR 2290 Sold, you can customize it. InkDance Price: USD 1882 /GBP 1544 /EUR 1788 Sold, you can customize it. InkDance Price: USD 503 /GBP 413 /EUR 478 Sold, you can customize it.